The summer 2013 issue of Arab Media and Society offers two useful articles on the changes in news media in post-Mubarak Egypt. El Nawany’s review provides a convenient chapter by chapter summary of Sakr’s book, which begins with an account of the “unpaid journalists” who covered the protests in Tahrir Square, moves on to the failure of Egyptian journalists to establish a uniform set of professional standards, discusses the limited funding models available to Egyptian media, and the failure of unions to provide protection for Egyptian journalists–affecting professional ethics, issues of governance and self-regulation. her failure to contextualize her account in a more detailed, historicized and nuanced account of the relations between the Egyptian media and the Egyptian state. El Nawawy himself is no newcomer to the Middle East media scholarship circuit; he is the coauthor of a very readable book on Al Jazeera. The second piece is far more engaging. “A Revolutionary Role or a Remnant of the Past? The Future of the Egyptian Journalist Syndicate after the January 25th Revolution” by Miriam Berger. Berger’s essay describes conditions in the Egyptian Journalist’s Syndicate, which was nothing but a tool for the regime to control the press in mubarak’s time. Since the uprisings, there’s been considerable struggle to make this institution more relevant–capable, for example, of enacting some of the reforms Sakr recommends–even as many journalists abandon it to form their own independent (and illegal) syndicates and unions. When the January 25th revolution swept through the streets of Cairo, the Egyptian Journalist Syndicate (EJS) remained silent. The EJS—the only journalist union permitted under the constitution—released no condemnations calling for the protection of journalists in the field, and provided no services to media workers attacked in the streets. 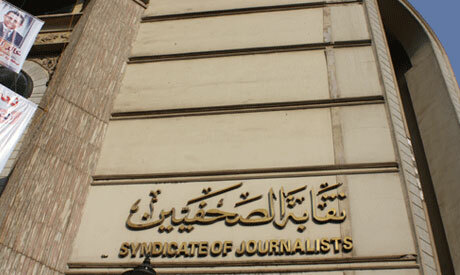 Recalled in Egyptian journalistic lore as a fighting force for independence, the syndicate had become, by Mubarak’s fall, in the words of one prominent journalist, “hijacked”—a mere vehicle for political handouts—and isolated from real developments in the journalism field. In the two years since the revolution, syndicate activists have rallied around calls for changes in the body’s membership, financial and legal structures; however, as in many Egyptian institutions, entrenched political and economic interests have largely prevented any substantial reforms. In this article I chronicle the EJS’s major problems and prospects since the revolution, covering the influential events and individuals who have played a role during the SCAF and Muslim Brotherhood rule. I begin with the March 2013 mid-term syndicate elections in which, in a highly charged vote, a notable Muslim Brotherhood critic, Diaa Rashwan, was elected to replace a Muslim Brotherhood supporter, Mamdouh Waly. Although conveyed in the local press as a positive step towards the syndicate’s de-politicization, I will show how these elections were still symptomatic of the syndicate’s fundamental dysfunctions. I then discuss the political, economic, and professional crises facing the syndicate, chronicle the historical development of these limitations, and assess the syndicate’s prospects for meaningful reform. Overall I report that while there is a generally open discussion about the need for change, the political and economic climate in Egypt—and in the syndicate more specifically—remains unfavorable to the fundamental reforms needed to turn the syndicate’s rhetoric of being an independent force for freedom of the press into a reality. Sakr, Naomi. 2013. Transformations in Egyptian Journalism: Media and the Arab Uprisings. I.B. Tauris.